I'm sorry, I'm late with Vintage Bliss Tuesdays today. I didn't get around to setting up the post last night and I was busy this morning. You see, my sister-in-law and I had to buy tickets for our daughters' dance recital. You would have thought we were buying Pearl Jam tickets or something. We had to go right online when the sale started and we still ended up with seats several rows back! Worth the effort though for sure! The dance recital is a highlight of the year for us. Anyway, I have been hard at work this month with my 4-month purge. I am quite proud of myself because I have never been so successful at discarding/donating items in the past. I am constantly looking for excess items now. You can read the first post in my 4-month purge series to find out more. I'll have an update fairly soon too. 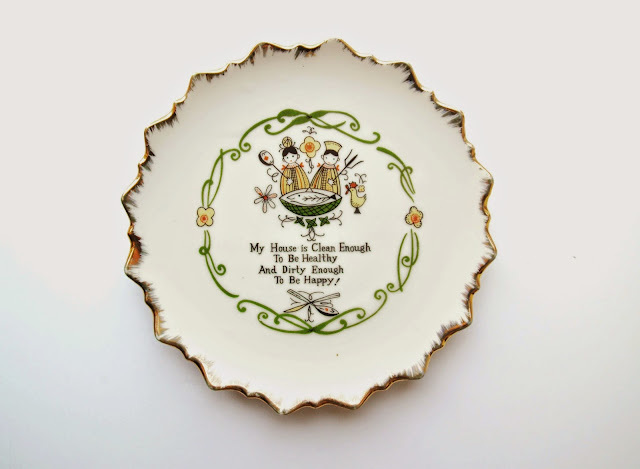 In the meantime, I thought it would be appropriate to share a look at this little plate I have in my collection of vintage dishes. I believe this one came from my Nana. My House is Clean Enough To Be Healthy And Dirty Enough To Be Happy! This plate is meant to be displayed on the wall, but I never got around to it. Despite my best intentions, I think all the excess STUFF in our house made me feel that it leaned towards the "dirty" too much. I'm thinking it would be a great idea to finish my 4-month purge (at the end of August) by posting this on the wall in celebration. Which way do you feel your home leans? Hi Joann. Just spent an hour steam cleaning in my bathroom (first try with that handy tool) and did get the walls somewhat cleaner, the floor looks better, the toilet IS cleaner. Back to vintage, love vintage, have WAY too much vintage. Thanks for Is Vintage Bliss Tuesdays 36. Wow Joy, that sounds like a thorough clean! I have not tried that tool...yet! I'd like to think my house is clean but my mum's take is that because we have so much stuff, it never looks tidy! I try to keep half the house tidy at all times but more the half that unannounced visitors would see ;) I've got loads of bags to donate this week after purging all the wardrobes and toy storage in the house but unfortunately the charity I'm going to is a fair drive away and we have to wait until we have a day free (until then my spare room is literally covered with bags). That's what I feel - we have too much stuff for it to look tidy. Funny that your mom says that to you though. ;) I feel like we should try to at least keep the foyer clean for people who come to the door. But we tend to let the shoes pile up. I have been immediately putting the boxes and bags of donation items into my car, so that they are out of the house. Then I can drop them at a thrift shop whenever I pass one. I have to start room by room and price stuff to sell and/or give it to the thrift store. I have way too much stuff sitting around. Love the plate! My grandmother had this hanging in her little house when I was growing up, I LOVED it. Now I want one!! She also had another saying on her wall The road to a friend's house is never long. 4 month purge GO YOU!! That is amazing that your grandmother had this plate too Laura! How sweet. I like the other saying too!